I haven't looked at the comments, maybe someone pointed this out already. I stopped watching somewhere after Dave mentioned the 2264 kJ/kg for phase changing. There is your mistake. Right at the beginning. You're dealing with humid air, not clean water vapor. Entirely different equations apply there. If we extrapolate the diagram you can see you need to take away roughly 10kJ from 1kg of humid air to extract 0,02 kg of water from the air with 90% humidity and 40°C by cooling it to roughly 18°C. So in total you'd need 500kJ of energy to produce a liter of water from 50kg of humid air. The greater the humidity and higher the temperature the easier it is to extract the water from the air. I won't do further analysis if the thing is viable from the electrical standpoint. I just wanted to point out the mistake. The energy to cool humid air has two components - that needed for the sensible cooling of both the air and the water vapour (which is not much more than 1010J/kg/K of dry air) to reduce the temperature to the dew point, plus the 2502kJ per kg of water per degree Kelvin energy of latent heat to condense the water. It's clearly shown in the example. Note that the 2502kJ/kg/K in the example (should actually be 2466) differs from Dave's 2264kj/kg/K figure because of the different temperatures involved - Dave got it wrong because that is the value for water at 100C. At 38C (the dew point for 90% RH) it's actually worse - 2410kj/kg/K! If he was being picky he could have also added the sensible cooling element (to coil the air by 2 degrees C down to the dew point) as well but it only makes a couple of % difference. Dave is quite right in that the project is entirely implausible but it is possible to get decent COPs out of Peltiers. For a delta T of 8C the COP can exceed 5 which means the panel would only need to be 50W (still huge). To get that COP you'd have to run Peltiers at around 10 to 12% of their peak voltage, and 50mm square devices would only pump around 20 to 30W each at most (perhaps 5% of Qmax). Thus you'd need at least 10 of them but they are pretty cheap on Ebay. They would weigh around 250g in total so not too bad. Delta T of 8C isn't much so you would need some decent heatsinks, but having lots of Peltiers helps considerably by increasing the area through which the 300W (@ COP = 5) of heat has to flow and thus the temperature differences required at the Peltier/heatsink interfaces. Using the cooled, dehumidified air to cool the heatsink would also help a bit. Still 300W, Delta T = 8 means heatsinks with less than .027C/Wwith moving air. How fast can you peddle? Perhaps one of the most difficult problems would be managing the airflow so it spends just long enough on the cold side to release sufficient of its water but not getting cooled below the dew point any more than necessary wasting energy. If it flows too quickly though energy is wasting by sensible cooling of the air + water vapour, but not enough to condense any or all of its water. Quite tricky I'd have thought as you would need to be able to measure RH fairly accurately. Might be more sensible to carry a few bottles of water and flog them to your cycling buddies examining their few drops of tepid, polluted condensate (distilled eau d'cyclist sweat anyone?) after a few hours of cycling in 40C/90%RH conditions. What is it with people in this thread incorrectly tacking "per hour" on things which are already dimensionally consistent? I don't understand why people keep saying Dave is wrong there. The process of condensation is exothermic (it releases energy) equivalent to the heat of vaporization (just opposite sign), which is 2257 kJ/kg. Whatever energy is dumped into the peltier to heat it up will have to be reversed by energy put back into the peltier to cool that side down again. So the way I interpret this, 626.9 Wh is the energy you need just to keep the peltier at the same temperature while 1 kg of water condenses on it. It might definitely be more complicated than it looks..
Whatever energy is dumped into the peltier to heat it up will have to be reversed by energy put back into the peltier to cool that side down again. Note that real-world peltier devices are typically so poor that they deliver a COP that barely reaches 1, so it just so happens to turn out that your assumption does typically hold true for peltier devices in "typical" situations. But it's certainly not enforced by the laws of thermodynamics. None of this changes the fact that the Fontus is completely bogus. I will happily admit that the situation is entirely different when it comes to heat pumps / heat exchangers / stuff with compressors and refrigerant. I just didn't think these concepts applied very well to Peltiers (if at all), but of course they do to some extent. For me it's just a habit, like AC Current. Couldn't the product work a lot better if they used the wheel of the bike as a power source? I think that should generate around 200W of power per hour which would at least be a huge upgrade from that tiny crap solar panel they are planning on using. A top level endurance cyclist can generate around 400 watts of power for several hours. This is not much. The self filling bottle would essentially piss away half of their available power for just a trickle of water. It would be orders of magnitude more efficient to simply carry a Camelbak backpack filled with water. "AC Current" makes sense because the "C" in "AC" isn't really a unit and you need to distinguish between AC Volts and AC Amperes. "200W per hour" is a semantic disaster though. True story: Here in Spain they measure rainfall in "liters per square meter". It makes me want to scream every time I hear it. Who in their right mind takes a nice, easy-to-visualize-in-your-head unit like "millimeters" and thinks, "now let's multiply top and bottom by square meters, it'll make much more sense that way!"? The campaign site declares and illustrates that a bicycle is not necessarily needed, good luck with that crossing one of our deserts down here, a dingo took my bottle. Unfortunate choice of graphic. I wonder how many people will end up in position "B" if this thing goes on sale and people believe the writing on the box. Will the makers be liable? It seems I made a mistake reading the diagram. The enthalpy units at the upper left side lead me to believe the vertical scale is enthalpy but it's actually temperature. I drew the process in it and found it takes 104kJ to extract 31,6 grams of water from 1kg of air by cooling the air to 18°C. If I made a mistake again, someone please correct me. I haven't investigated but they probably use a heat exchanger in order to precool the intake air using the outlet air to get a higher efficiency. It seems a waste of energy if they didn't do so. Perhaps this embodies a fundamental misunderstanding here by some people. Putting energy into any closed system cannot cool it down (unless somewhere in the system heat energy is being converted into another kind of energy e.g. chemical potential energy). There is no such thing as reverse or negative energy (an energy expressed as a negative number just implies energy moving in the opposite direction e.g. exothermic or endothermic). Any electrical energy into a Peltier will need to be dumped as heat as well as the energy released from the phase change of water vapour into liquid as well as the energy taken from anything else that is cooled on the cold side (e.g. nitrogen, oxygen gas in air). Hence rs20's post where an air conditioner has 100J of electrical energy put in, 300J is taken from the 'cool' side and 400J is delivered to the hot side (300+100=400). Conservation of energy must be obeyed (note that we haven't mentioned the fan here). And that is how any cooling system works - it just moves energy around (or converts heat into another form of energy that can be moved away). If it so happens that a phase change of gas/vapour to a liquid occurs because of the cooling, then that just means more energy to move away. Calculating the latent heat of a phase change does NOT fundamentally tell you how much energy you need to make it happen. All it tells you is at least how much energy needs to be removed. That is my point. Calculating the latent heat of a phase change does NOT fundamentally tell you how much energy you need to make it happen. All it tells you is at least how much energy needs to be removed. That is my point. Yep. Dave's calculation isn't correct or complete, but it's enough to prove this bottle will disappoint every single buyer (even the ones who don't die of thirst). No, it is not enough; it is only the start. What may be enough is to compare the practical efficiencies of dehumidifiers and air conditioners as has been done. However, this does not prove a new invention or discovery of some kind involving energy transfer could not make it work; it is just unlikely. Yes, it is. It's plenty to prove that that bottle cannot work as claimed. Someone please get a small 4x4 cm peltier, run it at 15W with a cooler suspended above a cup and do a timelapse! -gasp- a solar cell with a batterizer attached to it ! Yeah, Dave may have been a bit sloppy with the terminology but is basically correct. If you want to turn water vapor into liquid water then you need as a minimum remove the latent heat somehow. Dave shows very convincingly that you can not even do that with such a tiny solar cell and peltier device in a few hours as they claim. The thing will never produce enough water to be useful. 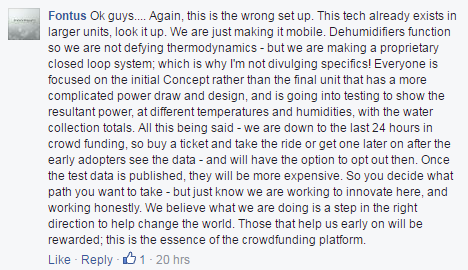 "we'll reveal the data to backers once we get the money"
If it works then reveal it now and you'll get more backers!